Welcome to our EZ Lite Truck Camper sales page. 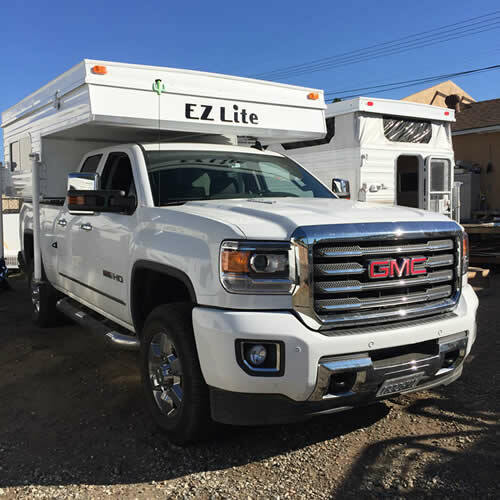 Here at EZ Lite Campers we build truck campers for all makes and models of trucks. Hand crafted with only the finest ingredients, our high quality truck campers are second to none. All our campers are built by craftsmen with over 70 years of combined camper building experience. We use real hand stained and finished wood interiors, glued, screwed, and doweled wood frames, and foam block insulation.That's quality you can count on! Come on down and see an EZ Lite truck camper being built and see the quality for yourself. Because we stand behind all of our campers, every EZ Lite is backed by a standard 1 year warranty. We also have truck camper hold down brackets of all types in stock, and do the complete camper installation. Buy factory direct with confidence and save thousands!